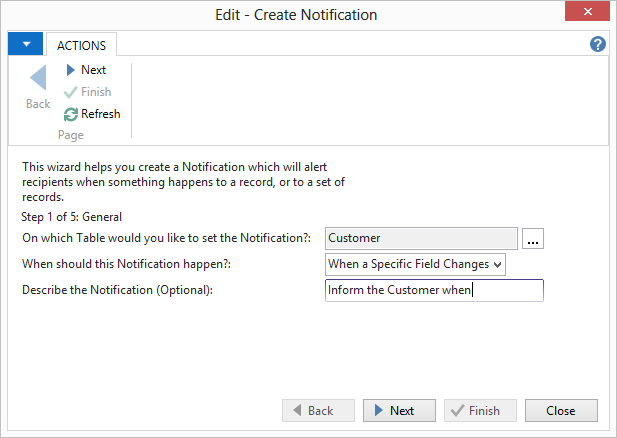 Advanced Notifications provides users the ability to subscribe to real-time alerts about critical events happening in Dynamics NAV. Users are able to define custom rules through a simple, streamlined interface, and can select from any record in the database to be tracked and monitored by the system. The user can elect to receive an e-mail, a notification through NAV, or even nominate a third party to receive the message instead. An unlimited number of notifications can be defined, based on your individual requirements. Advanced Notifications can be easily be used with any functional area in NAV, notifying anyone, even customers or vendors. Simplifies the process of communicating with external parties by automating repetitive email message. Advanced Notifications provide a framework to let you better respond to business events, allowing you to construct your own tailored messages to suit your individual requirements. Contact us today for a demo. Easily let users create notifications without requiring administrative access.